Member for Parramatta Geoff Lee (centre) welcomes Westmead’s new medical graduates with chief medical advisor A/Prof Ros Cramption (far left). 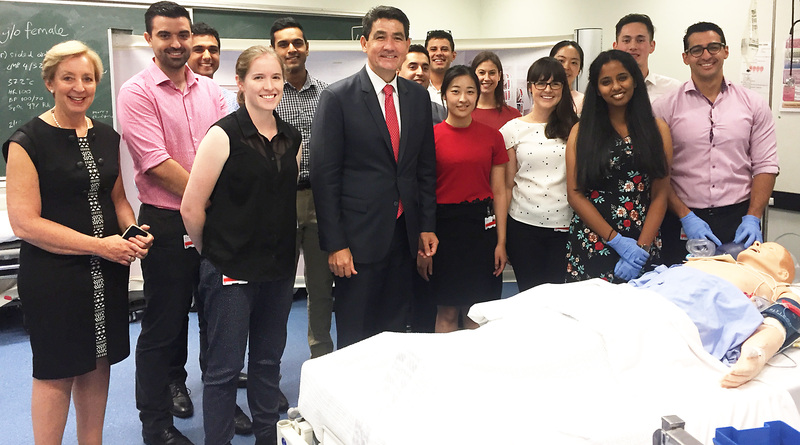 Member for Parramatta Geoff Lee welcomed 89 new medical graduates at Westmead Hospital this week. The junior doctors will work across Western Sydney Local Health District (WSLHD) hospitals this year. They will attend a two-week orientation program before commencing their rotations in medicine, surgery obstetrics and gynaecology, imaging and emergency. “I am delighted to see so many bright and hardworking new doctors at Westmead Hospital,” Geoff said. “The new doctors are part of a record intake with 999 new interns across NSW eager to start their medical careers in our hospitals. “Westmead Hospital is undergoing a $1 billion redevelopment, the largest in NSW history, and these new doctors are a welcome addition. “It is so important that we train new doctors to meet our future needs and these new interns will complement the growing the demand in our area. “The record numbers are a great reflection of how our state-wide internship program is helping make sure NSW is leading the nation when it comes to training new doctors. The NSW Government’s investment of over $107 million to the program is ensuring NSW is delivering new doctors. NSW guarantees intern positions to all domestic medical graduates for NSW universities. NSW also provides internships to many graduates from interstate universities and, where possible, international full-fee paying medical graduates. NSW is the only state to offer two-year employment contracts to graduates commencing their internship which includes a rotation through a network of metropolitan, regional and rural hospitals.